Mixed martial artists might be crying for bigger paydays believing their bosses are essentially printing money after each event, which might be the case, but things could certainly be better for the Ultimate Fighting Championship. Standard & Poor’s Ratings Services has issued a revised profit outlook for Zuffa LLC, the parent company of the UFC, claiming the planet’s premier MMA promotion is facing a 40 percent drop in profits for 2014 due to injuries and canceled bouts. “A negative rating action could occur if we are not confident that Zuffa’s operations are recovering meaningfully by the first quarter of 2015,” S&P expressed in a statement. S&P previously anticipated Zuffa’s earnings before interest, taxes, depreciation and amortization would fall just 30 percent this year. S&P’s revised projection came following Saturday’s UFC 180 event in Mexico. Heavyweight champion Cain Velasquez was forced to pull out of the promotion’s debut in Mexico with a knee injury, which drastically affected the show’s performance. That came on the heels of August’s “postponed” UFC 176 event in Los Angeles after featherweight champ Jose Aldo withdrew with neck and shoulder wounds. In addition, light heavyweight king Jon Jones was slated to grant Alexander Gustafsson a rematch until Gustafsson got hurt. Jones was then scheduled to fight bitter rival Daniel Cormier in December in one of the most anticipated scraps in UFC history until Jones had to push the bout back to January 3 due to a leg injury. Middleweight title holder Chris Weidman was also supposed to meet Vitor Belfort in December. That shootout will now take place February 28. 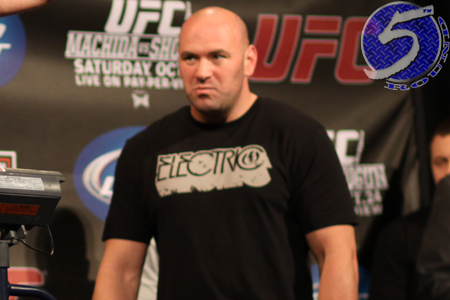 UFC president Dana White (pictured) admitted earlier this month that the company’s pay-per-view numbers were down in America compared to past years. However, White claimed to be fine with the decline because of their aggressive global expansion. Don’t worry, the UFC isn’t going under anytime soon. They are just three years into a seven-year, reported $100 million per year broadcast deal with FOX.